Dr Sok Siphana, Managing Partner at SokSiphana&associates (a member of ZICO Law) was named as one of the Financial Times’ top 10 most innovative lawyers at the fourth FT Asia-Pacific Innovative Lawyers awards held on 1 June 2017 in Hong Kong. Among 400 individual submissions from 68 different law firms, Dr Siphana has been recognised for his outstanding leadership and innovation. 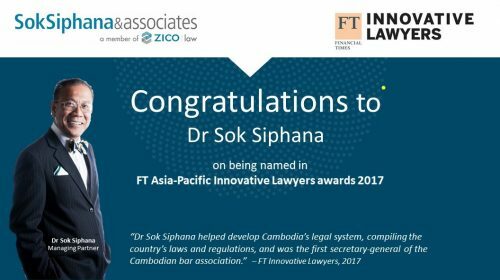 He was praised in the FT report as one ten Asia-Pacific lawyers who “stand out for their willingness to try fresh ideas”. Credited for numerous works including the progression of the Cambodian legal system, moving the country towards WTO membership, and encouraging and empowering young Cambodians and female entrepreneurs, he continues his efforts today to reduce international intervention on the country’s legal profession and to build solid commercial practice areas. The FT Innovative awards have been running for four years in the Asia-Pacific region, honouring outstanding law firms and individuals in four broad categories: legal expertise, the business of law, social responsibilities and innovative individuals. The Financial Times invites nominations for these areas from law firms and legal service providers of clients or in-house lawyers “driving innovation in their businesses or the profession’. A full list of the FT innovative Lawyers Awards for the Asia Pacific region in 2017 can be found HERE. Always at the forefront of innovation, ZICO Law was also listed amongst the top 25 in the 2017 FT Law 25, a ranking of Asia-Pacific-headquartered law firms, and was awarded ‘Highly Commended’ in the area of Legal Expertise – New Markets and Capital.